Spring is done and we’ve finally moved into summer bulb season! 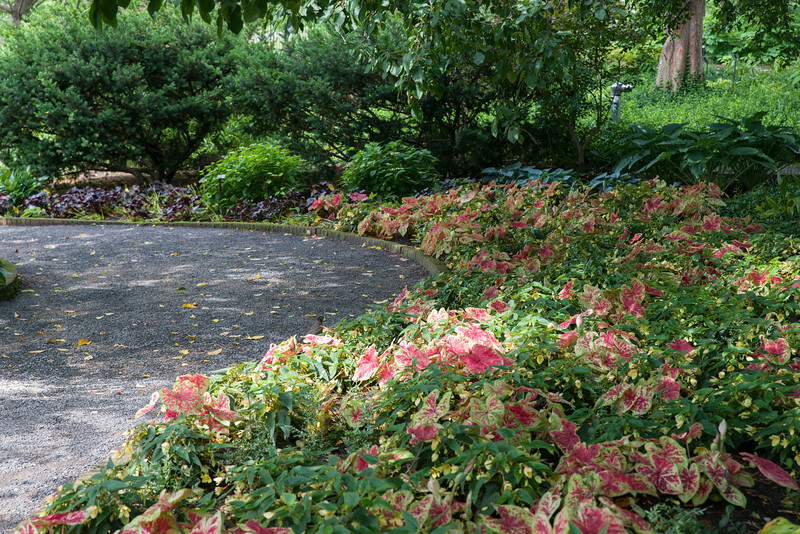 The annual beds have been replanted with sweeps of dahlias, cannas, caladium, and begonias to showcase these nonstop workhorses of the summer garden. Caladium bicolor ‘Raspberry Moon’, Begonia ‘Million Kisses Honeymoon’ and Cretan brake fern (Pteris cretica) light up the shade under the Selkirk crabapples. Caladium bicolor ‘Miss Muffet’ and Begonia × tuberhybrida ‘Illumination White’ make a great pairing for shady areas. 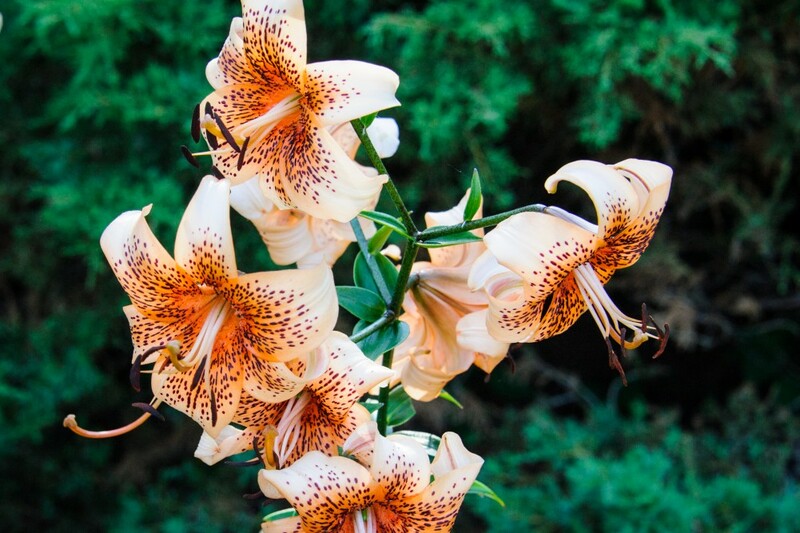 On the perennial side of things, we’re moving into lily season. The very first lilies to bloom are the martagon lilies (Lilium martagon) and their hybrids (such as Lilium martagon ‘Mrs. R.O. Backhouse’). 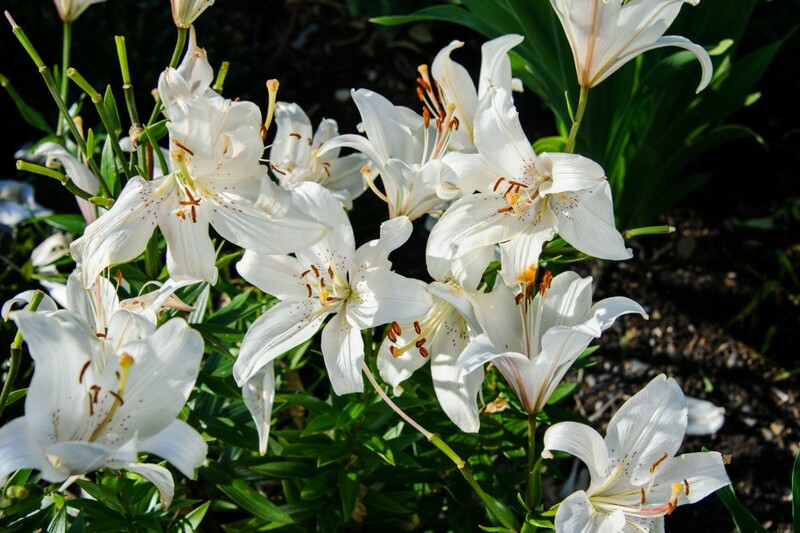 Martagon lilies are terrific plants for the shade garden because they provide both structure and color at a time when little else is blooming in the shade. 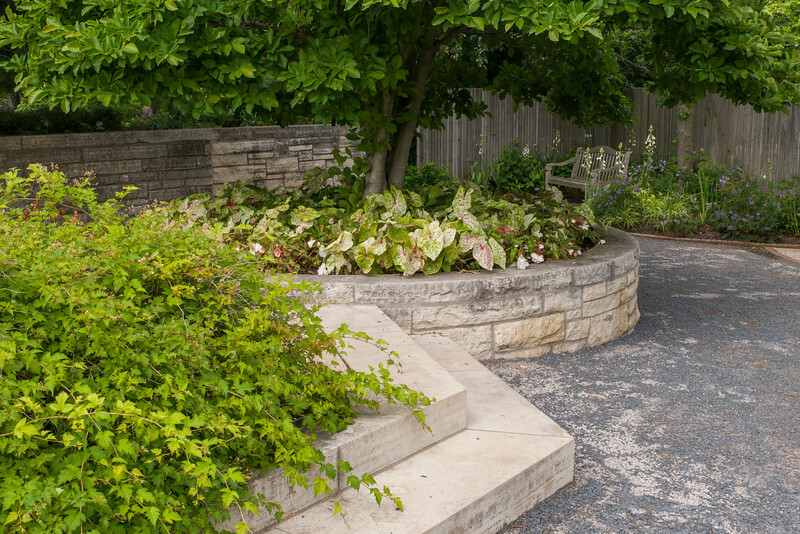 The leaves emerge in a layered whorl, giving the plants a pagoda-like structure. 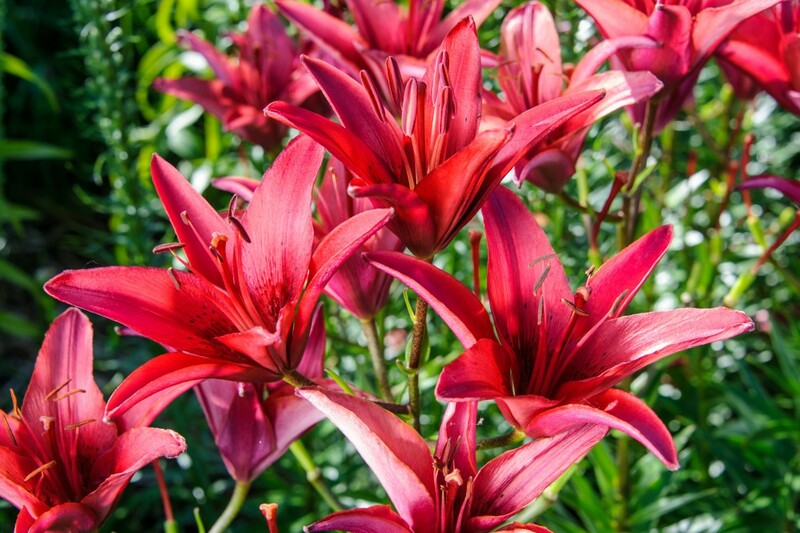 We’re also moving into Asiatic lily season with the first of those beginning to bloom in bold shades of pink, red, yellow, and orange. 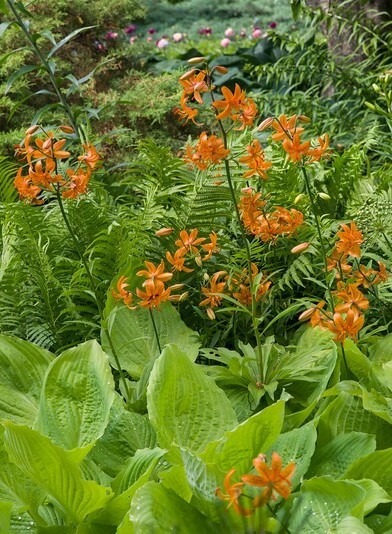 Lilium ‘Nepera’ is a vibrant orange martagon hybrid that lights up a shady corner. 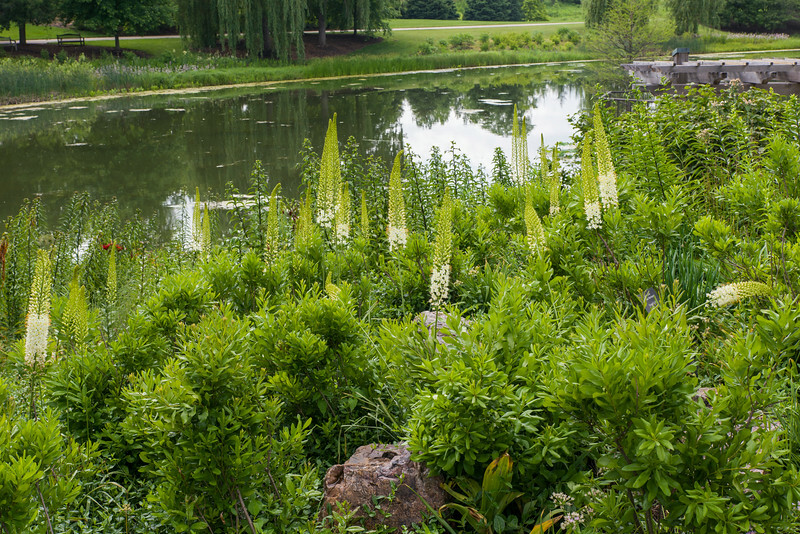 Pale yellow foxtail lilies (Eremurus ‘Lemon Meringue’) provide a fun summer surprise when planted among shrubs such as this bayberry (Myrica pensylvanica). In addition to the lilies, we’re also seeing some unusual bulbs such as Eremurus ‘Lemon Meringue’ in bloom. Eremurus have tall, bottle brush-like flowers that add an exotic flair to the garden. Smaller alliums such as Allium tanguticum ‘Balloon Bouquet’ and Allium senescens do not have the giant flower heads of their springtime relatives, but still provide a welcome change of pace from the more common flowers of summer. The Asiatic lilies are just starting to bloom in the sunnier areas of the garden. Photo by Bill Bishoff. Lilium ‘Sterling Star’ Asiatic Lily. Photo by Bill Bishoff. Lilium ‘Red Velvet’ Asiatic outfacing lily. Photo by Bill Bishoff.